The little seaside town of Beachport swells to mammoth proportions over the holiday period. This cinema runs movies throughout the Summer to keep the tourists entertained, and several screenings throughout the year for local fundraisers, the supper and a movie type of thing. On the topic of movies. Did you ever see the Bryan Brown movie Sweet Talker? It was made in Beachport, with many locals appearing as extras. Evenings on these Summer nights are chorused with cricket song(if you can call it that), and the squawking of Little Corellas. Our back fence is bordered with gums, and these birds come to roost at night, being their most noisiest around sunset. They are around during the day chattering about, but no where near as loud. They are hated by most people. I don't mind them, but, and I'm surprised, they haven't crapped all over the washing yet! Maybe they like me too. We've been caravaning by the sea this long weekend. It's back home today, then Izzy starts her first full kindy year tomorrow! On Sunday, I attended my first Australia Day breakfast ever, in Beachport. The breaky was delicious, it's a credit to the Beachport Lions Club and the perfect example that volunteers make the world go round. Standing, singing and listening to the crowd sing the national anthem was awesome, followed by the presentation. I'll be sure not to miss another Australia Day breakfast if I can help it, just for the food alone! Elaine Donaldson, receiving her Australia Day award. and The Beachport Duck Race won the event of the year. My mums recently acquired a few chickens. Minnie, who came all the way from Gippsland at christmas time in a cat carrier, in my sisters LandCruiser. My nephews had raised it and is quite tame. They even let it out to stretch it's legs along the way! Minnie was being attacked by the other chooks and they were happy to leave her with Mum and Dad. To tell the truth, Mum and Dad were becoming quite attached and charmed by her. She's just started laying eggs for them. Mum bought a couple little chicks a couple weeks ago too, the girls love to go see them when we drop in. The chicks are getting a bit harder to catch now they are bigger! Izzy would catch one, let Summer pat it and then place it in the nest, only for it to run out again. This chook house even has a kitchen sink. Where Minnie lays her one egg a day. Trying to convince the little buggers to come out, while the little chickens run away! I took these photos on Monday. I went to see Mum and Dad today and something had taken the baby chickens, they think it was a fox. What ever it was ate one of Minnies eggs too, just left the shell. Minnie looked lonely. Dad sounded a bit sad and sorry about losing the chickens, I think they were growing on him. I am sure he was disappointed for the girls, it bought him so much joy watching them try to catch them. They'll have to make the house more secure before they get some more. Izzy kept asking where the fox was, even though I'd said the chickens got out and run away. Kids have big ears and cotton on quick to adult conversations. Barbed wire orbs. The concrete stand was actually the lump they dug out the lawn that held the old metal clothesline! An old plough disk holds the orbs. It's the time of year.. It's the start of another week, thankfully, a much cooler week. How was the weather in the southern states? Crazy; but we survived, thanks to air conditioning and swimming pools. It's the last week of the school holidays in SA. Izzy will start full days at kindy this year. I will have to cherish having her home this week, I will miss her and be thinking of how her day is going...for the first couple of weeks. She did so well with pre-entry last term, I am sure she will be fine, although tired at the end of the day. to Corymbia ficifolia. It's native to WA. I love this time of year. The way the sun makes the garden look as it sets. The colours are spectacular, the greens striking and the whites brighter. I love the native birds that come to visit. Particularly the lorikeets that come to feed on the Red flowering gums in the driveway every year. I stood out there watching them a couple of nights ago, such a treat. We've seen rainbow lorikeets too and the usual cockies that all arrive at sunset with their raucous banter, in the gums that line our back fence. Have you ever seen a drop tail lizard? There are lots of them in our garden, thousands. The girls and I sat out on the grass in front of the veggie patch, watching for them darting around for a bake in the morning sun. We caught a few when I was a kid, they're bloody quick, I don't know how we did it. I did try to take better photos of them, but when I crouched down Sum would climb on my back, choking me with her arms around my neck. She loves doing it, like a clingy monkey. I thought this one might be preggers, but apparently they lay eggs at this time of year. I've never seen any, I'm surprised, there are shitloads of them running around. Do you have any natives coming to visit your backyard? Boggy had an RDO on Monday, it was going to be hot, so we headed off to Beachport for a spot of takeaway lunch at Woolleys Rock, and a look around at the rockpools. We drove to Southend along the beach, it was absolutely bloody gorgeous and much cooler than in town. While cruising along we spotted something big(and dead) on the beach and stopped to have a look. We couldn't work out what it was, probably a whale. Whatever it was it must have been in the sea a while before it washed up. It looked like a huge turtle at first, but there is no way they grow that big! We stopped further along the coast, closer to Southend and let the girls have a paddle. Sum LOVED it, we were finding it hard to keep her out of the water. We are in the middle of a heat wave. Yesterday it was 43, and supposed to be the same today, and a crazy 44 on Thursday. With it also being school holidays, our local swimming lake is being well used. It is filled in early November until about March, and maintained by the council. Back in my day(when I was a teenager, without a care in the world), you'd take your chances and go for a swim; in the hope you weren't going to come out of with an infection of some sort. Back then it wasn't chlorinated like it is these days. Thank gawd for that! The high school holds it's swimming carnival here in February, and there are VACSWIM lessons happening now. Izzy will do these next year, when she's 5. 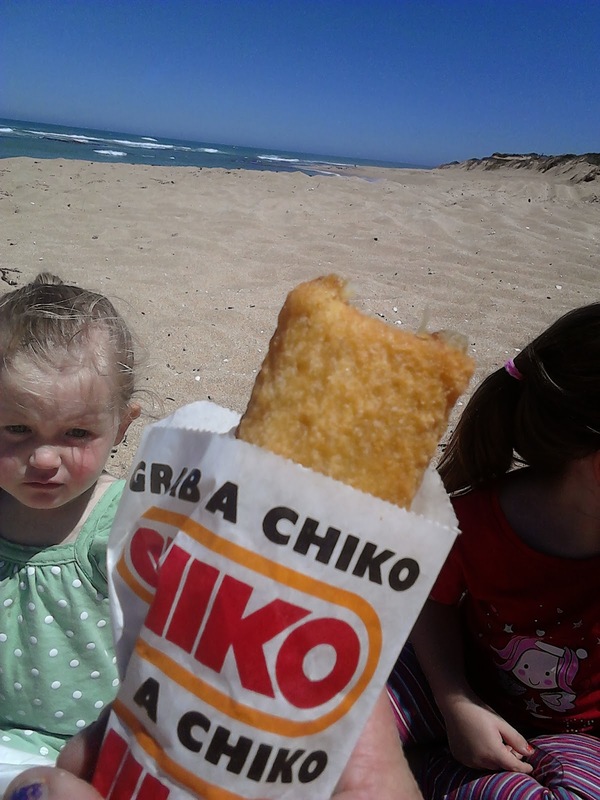 I took the girls down for a swim and some nuggets and chips for lunch from the lake shop, the chips aren't bad, as long as you eat them before the seagulls try to! Then it was home to the air conditioning.